Forget everything you think you know about vegetables and let me tell you what happens when you culture them. 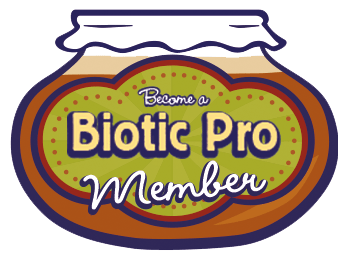 Grow your own probiotics in a jar of vegetables, and you’ll be shocked and amazed at all they can do. I feel like I’ve been standing on the top of a mountain singing the praises of cultured vegetables for fifteen years and some have listened and others not, but I knew one day there would be a tipping point and that day is almost here. 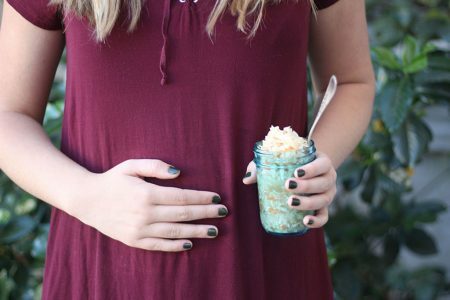 My life was dramatically changed by a jar of cultured vegetables that was teeming with billions of probiotics. Cultured veggies continue to amaze me and fill me with wonder but the help they provide can far surpass the things I have seen in myself and countless others. My everyday life is made better by eating a spoonful of these amazing vegetables. We keep a jar in our fridge at all times . . . okay, like at least six or more jars to be truthful. I like variety, what can I say? They will last for months on end. They are one of my secret weapons. I am crazy for these foods. They are more than food to me. They work like magic because of the special bacteria Lactobacillus plantarum (L. plantarum). Check out my many reasons to eat this superfood! This special bacteria (L. plantarum) can help remove pesticides and chemicals not only from the veggies but inside of you too. It’s exciting that microbes can help us by removing pesticides from our vegetables. It’s often a hardship for people to always buy organic, but the healthy bacteria L. plantarum can remedy this. L. plantarum bacterial strains studied from fermented vegetables in kimchi were found to be capable of degrading four different organophosphorus insecticides by using them as a source of carbon and phosphorous. 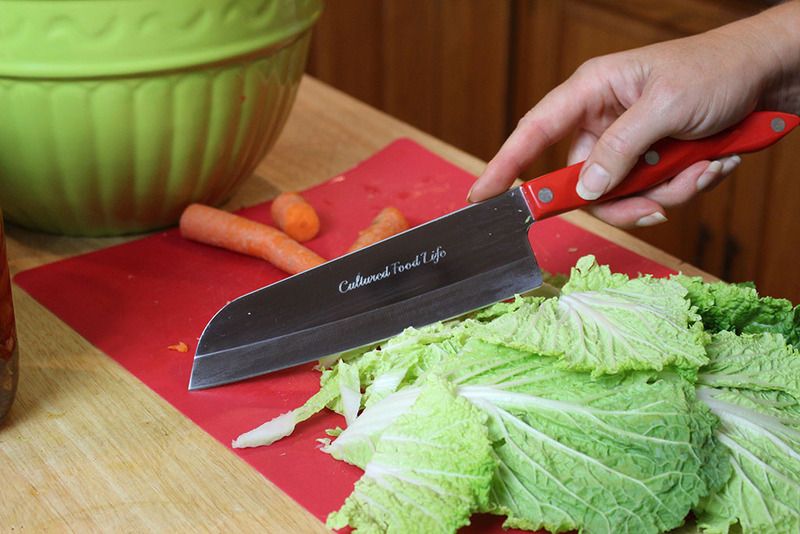 When you culture or ferment your cabbage into sauerkraut, the vitamin C and antioxidant levels go through the roof. 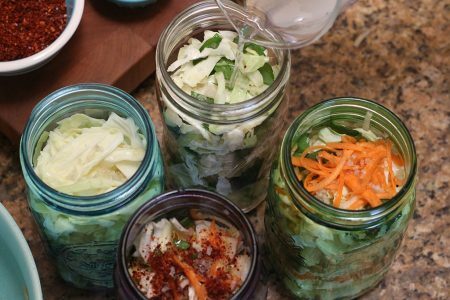 Researchers at Cornell University tested levels of antioxidants and vitamin C in sauerkraut and found the average level of vitamin C in raw cabbage was 57 mg per cup, but when fermented the level was close 700 mg! Vitamin C is also an antioxidant and it protects the body against stress and helps boost the immune system. 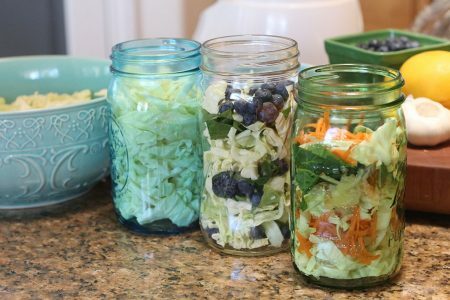 All cultured vegetables are wonderful sources of vitamin C. But cabbage, collards, and kale have the most – and when you then ferment them, you get more! 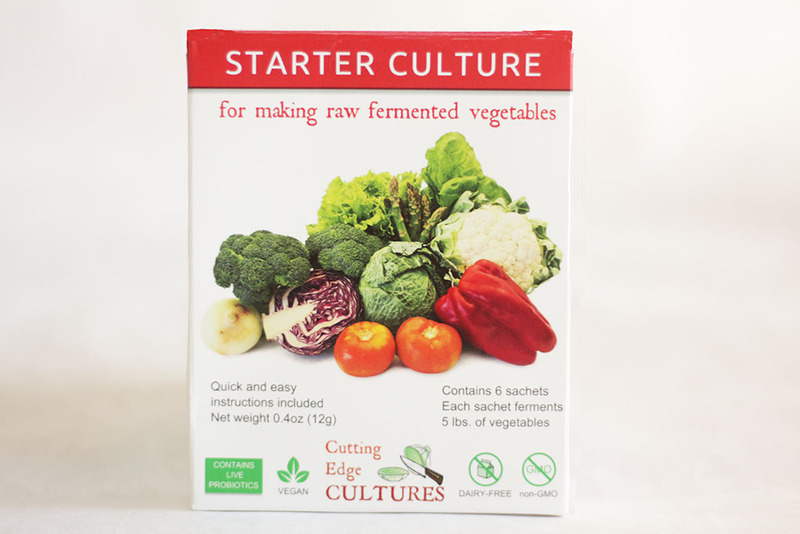 Not only do you get more vitamin C when you culture your vegetables, but the fermentation process also increases the nutrient availability in vegetables. This is due to the good bacteria (microflora) that are required to digest and utilize your food. L. plantarum is pretty powerful and can even knock out food poisoning, (as I myself have witnessed). It has been studied and found successful in the inhibition of food poisoning and pathogenic bacteria, and it is being studied for use in improving the microbiological safety of foods. It’s also superior for any kind of stomach distress. I’ve seen this again and again and received so many emails with stories telling me how effective it was in stopping vomiting, stomach cramps, and nausea with just a spoonful of the brine or vegetables. Try it and it will make you a believer, too. Nothing works better for stomach distress. Studies have shown that L. plantarum has potential cholesterol-lowering activity. Researchers investigated whether this bacteria could lower LDL and reduce blood levels of cholesterol esters – molecules of cholesterol attached to fatty acids, something that accounts for most total blood cholesterol and has been tied to cardiovascular disease risk. Scientists found that L. plantarum can impact cholesterol levels in several ways, including breaking apart molecules known as bile salts. Based on correlations between LDL reduction and bile measurements in the gut, the study results suggest L. plantarum broke up bile salts, leading to reduced cholesterol absorption in the gut and less LDL. The superstar bacteria in cultured vegetables, L. plantarum, is extremely hardy, survives stomach acid with ease, and can make the full trip from your mouth – to intestines – to colon – to colonize you in a powerful way. L. plantarum is a welcome guest that works mightily for you by fiercely attacking pathogenic (bad) bacteria in our bodies. It will strengthen your good bacteria by killing the bad guys, and then helps your own good bacteria grow stronger, and helps it to be more resistant to future invasions of pathogens. It’s important to note that this is a transient bacteria which means it will only last a few days in the body so it’s important to consume it often. Are you convinced yet?! Want to know how to make them? Let’s get started. Grab some canning jars and veggies and head on over to the How to Make Cultured Vegetables page. 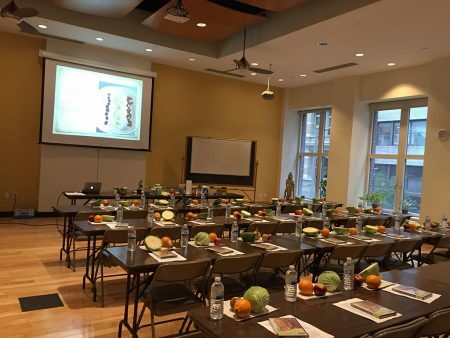 326 Responses to "What are Cultured Vegetables?" If I use a 5L crock, can I then transfer my ready veg into 1L jars if I have sterilised them? Also – if I use a mason jar to ferment in the first place – does it have to be covered with a tea towel if I am fermenting them in a bright room? No it doesn’t not, it will be fin without the tea towel. I always keep them on securely and this keeps it from developing white yeast and this also keeps the bugs out as well and haven’t had any problems. I was making sauerkraut and enjoying it but stopped when I’ve been told that eating raw veggies in the crucerfious family can negatively affect the thyroid. I have a sub-clinical hypothyroid condition. Cabbage, kale, broccoli & spinach have goitrogens in them. Goitrogens are negated through the cooking of these vegetables. Do you know if culturing these particular veggies are they still considered “raw” or because they are cultured the goitrogens are not a factor, as if the veggies were cooked. I recently purchased your gallon jar w/airlock and fermented some Red Cabbage, it’s been sitting on my counter for 10 days now and there are no bubbles at all. It just taste like salty, crunchy cabbage. It doesn’t have that “tangy” taste that other ferments (Green Cabbage) had that I made (without an airlock). Did you use a culture and how warm is your house? I naturally ferments with or without an airlock but if your house is colder it will take much longer. It should work fine at this temperature. 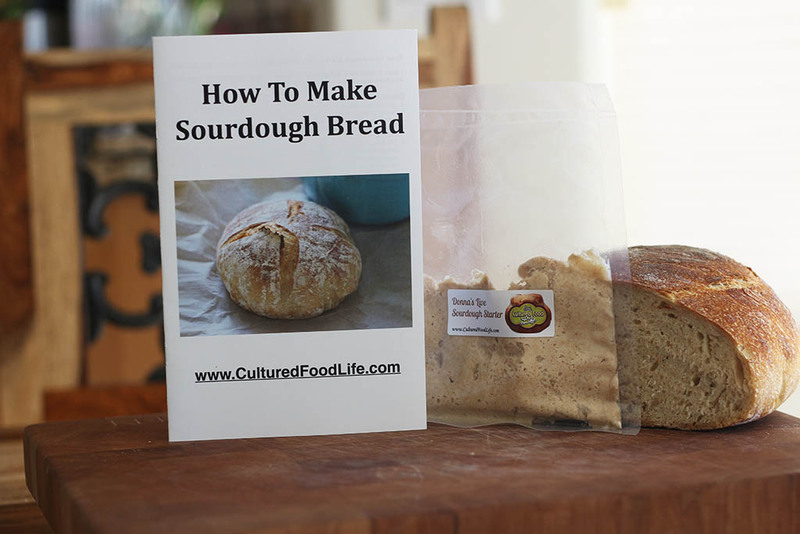 I don’t believe that adding salt, vinegar or brine is the same as producing a fermented product with live cultures. Pickling is different than fermentation. I’ve got a crock of sauerkraut on the go in heated garage approx. 50 degrees F sometimes gets quite cold. I started in the house just after Christmas so It has been almost 2 months and I do not believe it is ready yet. Would this cold hurt the fermentation process if not could I bring it inside in the warmth to continue fermentation. I have never seen any bubbles in the crock like I see in the jars that I have made before. What would you recommend. You can use fine or coarse salt. The airlocks produce a way for the gasses to escape but you don’t have to have them. They still ferment fine without them. 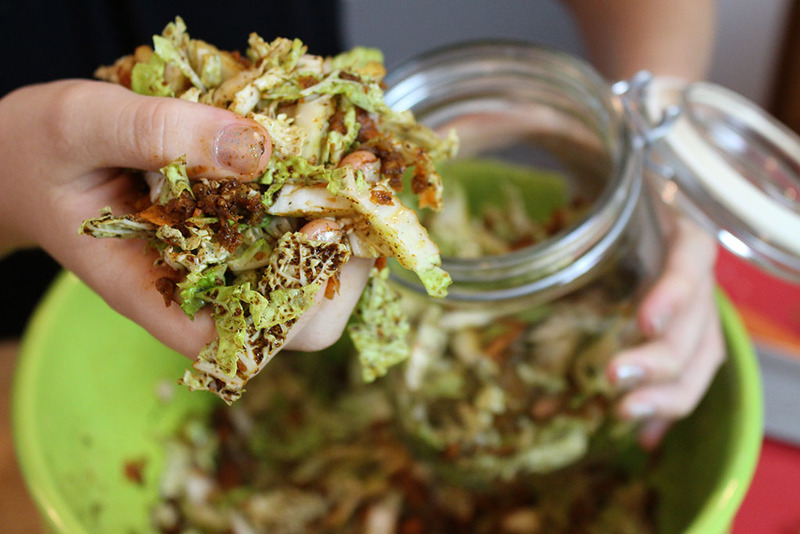 Do cultured vegetables get more or less sour the longer they are allowed to ferment? If I use the starter culture packets, do I need to use a new one for each batch? Or can I just use some of the already cultured veggies to start a new one? You can use the brine from the first batch to make another batch and keep doing it till it quits working. 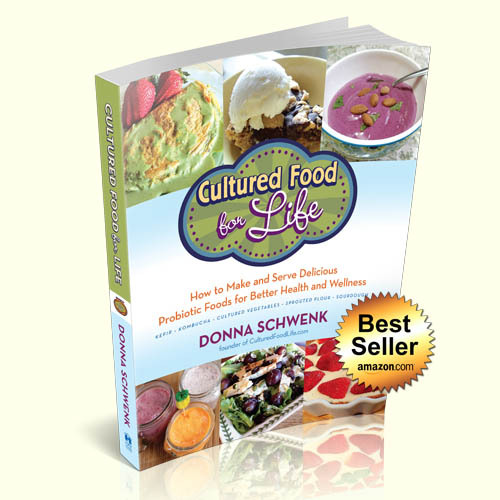 Hi Donna, Love your book. Can I use kefir water in my fermented veges as a starter. Should homemade Sauerkraut taste and smell like Bubbies? I’ve tried a couple of batches with the Caldwell culture starter but they don’t smell great. I’m not sure if I’ve done something wrong. 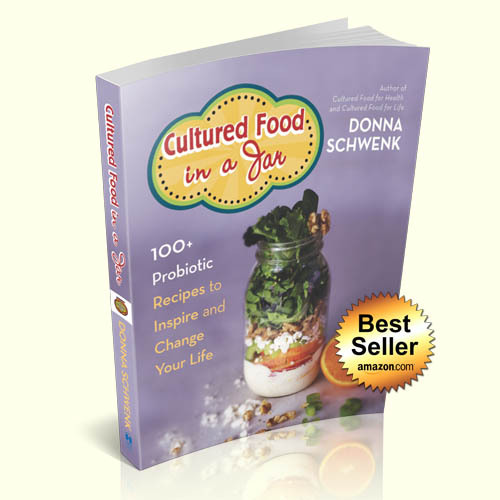 How long did you let them culture for and what did you add to your sauerkraut? I used 1 head of organic cabbage, 1/2 tbsp of Celtic Sea Salt and 1/2 package of the culture starter activated in 1/2 cup of water with 1 tsp of sugar. I put it in two mason jars with a ceramic weight and an airlock plastic lid. It sat in a dark cupboard in my kitchen (around 72 degrees) for 6 days. The liquid covered the cabbage but it didn’t ever bubble much. Thank you so much for your help! Hope you are well. 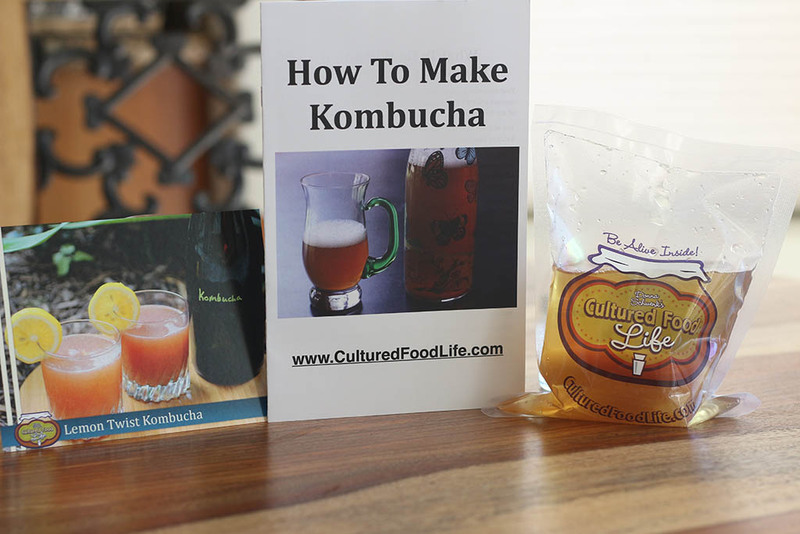 I have recently started kefir and cultured veggies. After a few days of kefir my face skin has started to breakout. It’s like an allergic reaction type of thing. 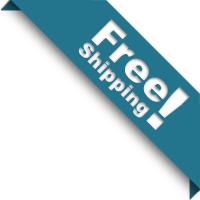 I suffered from rosacea and hive for a long time and finally it went away after trying so many different remedies. I am really scared that it doesn’t start up again. It’s been about a week now that the problem started. I have stopped the kefir and veggies completely now, but I think it’s the kefir that might be doing it. Has anybody has else had similar problems? I have bought some anti-histamines which I haven’t taken yet. Please advise on what I should do? My skin has done a similar thing…but I’ve continued with the fermented foods and it’s passing. I felt like it was the “healing crisis” I’ve heard mentioned. How long did it take this phase to pass? I am thinking of starting on the kefir and veggies again as I really do enjoy them. How much kefir do you drink a day and how much veggies do you eat? And did you take any DAO supplement? Hope you are well? My face has cleared up now – just get the odd spot here and there. I want to start on the kefir and veggies again but which one should I start with? And how much of each should I consume in a day to start with. Also, would it be better to start with ready made kefir you get in the shops as there are many varieties available here in the UK. I feel the homemade one may be too strong for me as a starter. And is the alcohol content higher in the homemade kefir than the ready made one in shops? Grateful for your help and early response as I really want to be able to include these miracle foods in my diet asap? Do which ever one feels of most interests to you. They’re both great for you. 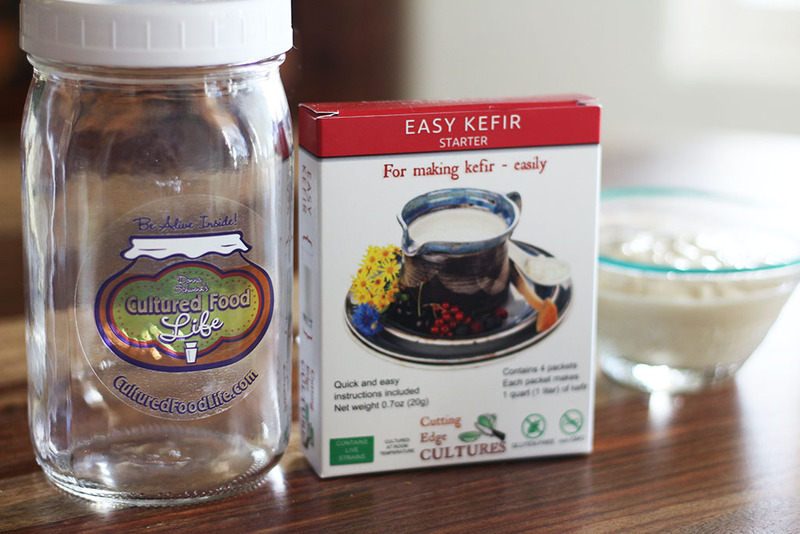 If you do kefir start with 1/4 cup a day and build up to at least a cup a day. Veggies start with 1 tablespoon a day and then you can have more after you adjust. Glad your having success. Good job! Donna , I have packed some jars with shredded cultured veggies and covered with cabbage leaves. When I pressed the veggies down after placing the cabbage leaves on top a lot of brine has come to the top. Is it ok to get pour that out of the jar as it has become a bit full and the brine is oozing out. Also I have metal lid on the jar and the brine oozing out smelt a bit metallic. I think I packed the jars too full. 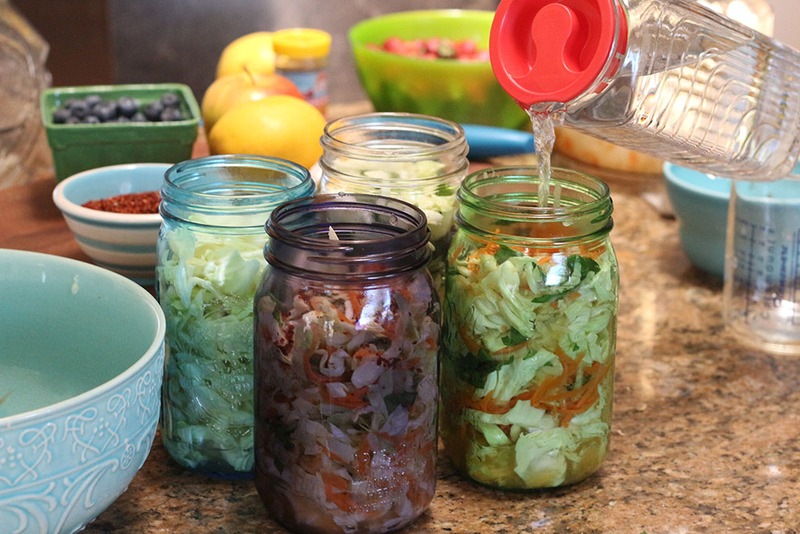 Yes, you can remove some brine or move some of the veggies to another jar so it is less full. 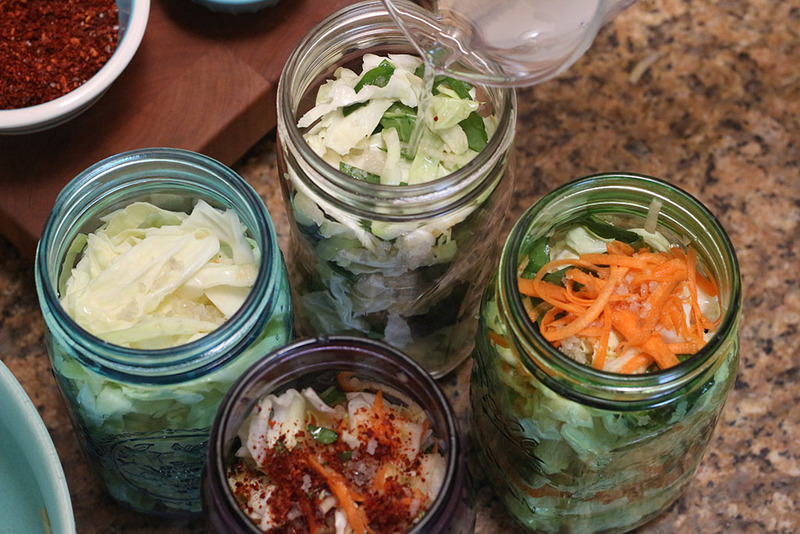 I tasted the cabbage + carrot jar today after 7 day – it’s quite cool in the kitchen. Although it tastes ok the veggies are still a bit on the hard side. Are they supposed to be like that? How do I know when they are done? Thanks. Let them ferment a little longer but if they taste sour like kraut its done. No you can’t culture veggies with kefir grains, but you can use the whey from kefir to culture the veggies. When making brine how much salt to water should be used? Grateful for your early reply as I’m planning to ferment some veggies tomorrow. Many thanks. https://www.culturedfoodlife.com/recipe/sauerkraut-without-culture/ 2 to 3 tablespoons per gallon. Can I use salt brine and powdered probiotics to make starter culture for fermented veggies? Dr Mercola used celery juice and probiotic caps in his one. -Could you please repeat the olive oil trick referenced below? Hey thanks for that, you have been very helpful, I can’t wait to try my new kefir veg with your olive oil trick on the top. Sam from New Zealand. -How long should I leave my kimchee on the counter? I have seen several days to 6 weeks. 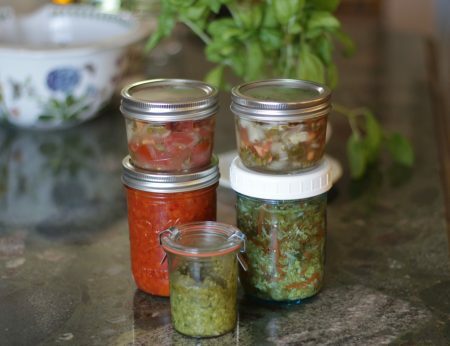 If I ferment my veggies in a regular mason jar with lid is it necessary to burp the jar daily? Nope you can just leave them. I made the mistake of storing my Body Ecology culture starter in my cool basement for a number if months instead of my refrigerator. Will it still work? I think it will still be fine. I am fermenting cabbage on my counter, but about an inch of the cabbage has come above the water and has been that way for a few days. Is my fermentation ruined? Thanks for your help!! No it is fine it will just turn a little darker and you can push it down under the water or add more water. No worries it is fine. Hi Donna! 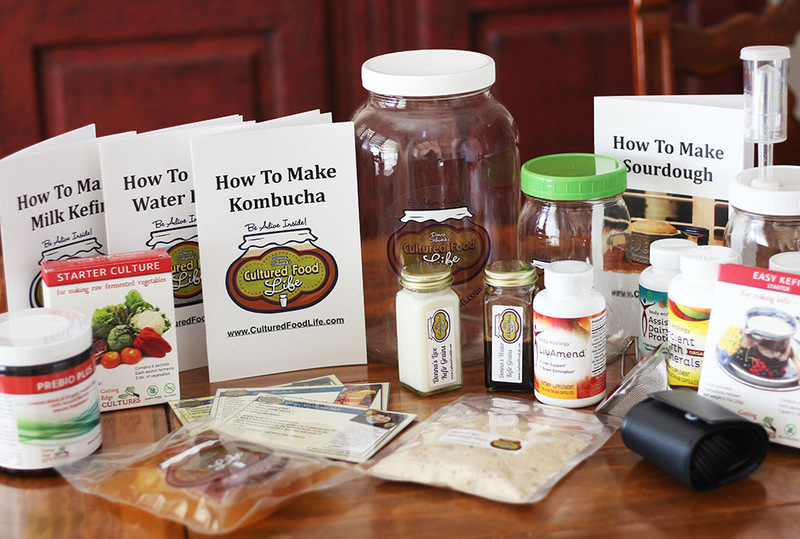 Thanks so much for your website and books, we love our kefir and kombucha. Just bought some Caldwell’s starter to ferment some veggies, wondering how much salt we are supposed to add to prevent soggy veggies? It really depends on how much you are making and it is best to just follow a recipe. Thanks for a nice site. I’ve fermented vegetables for a long time and tried many recipes. Caldwells worked OK. However, BodyEcology seemed to create a more complex taste. In any case, thanks for some nice recipes and good suggestions. 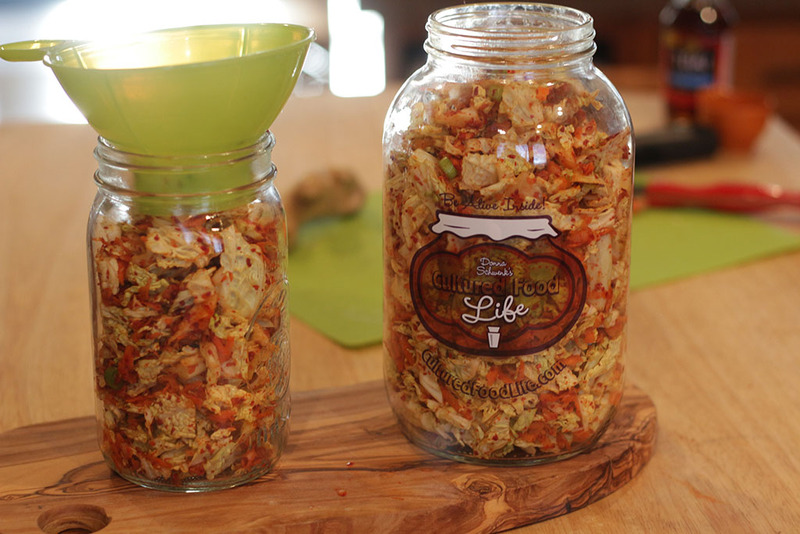 Is it possible to go so wrong with fermented veggies that it’s not edible ? and in case how do I know it? This isn’t really a reply but I don’t see a place to ask a question. Do you know if any of the starter is made from GMO crops? ….like sugar, or what is the bacteria grown in? I used a Vita Mix to shred my cabbage, it came out mushy. I only filled a 26oz jar and used 1 teaspoon of salt. The water does not seem to separate from the cabbage. Also i live at 8000 feet and last time i tried making the cabbage it did not bubble. Is this due to the elevation? 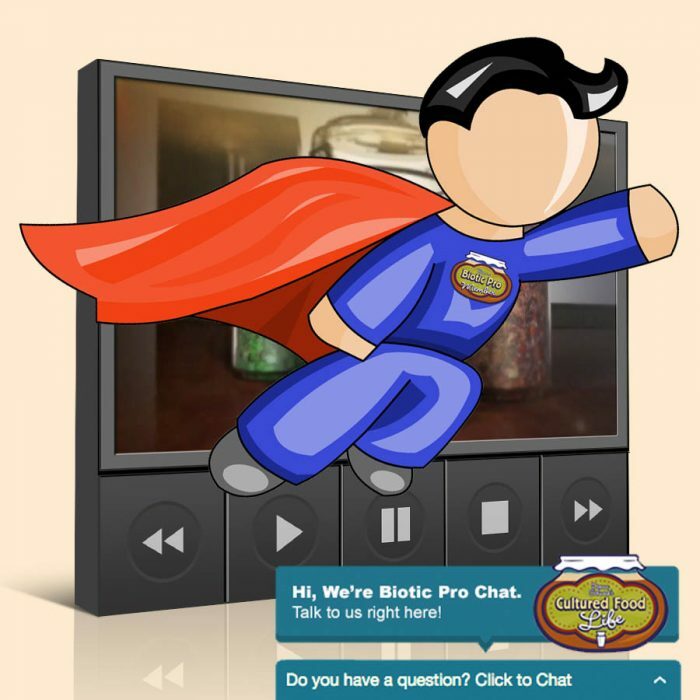 Did you use a culture starter? How long did you let it ferment? 1. Would I have problems using the normal golden lid of the mason jar? 2. Can I use Himalayan Pink salt? 3. 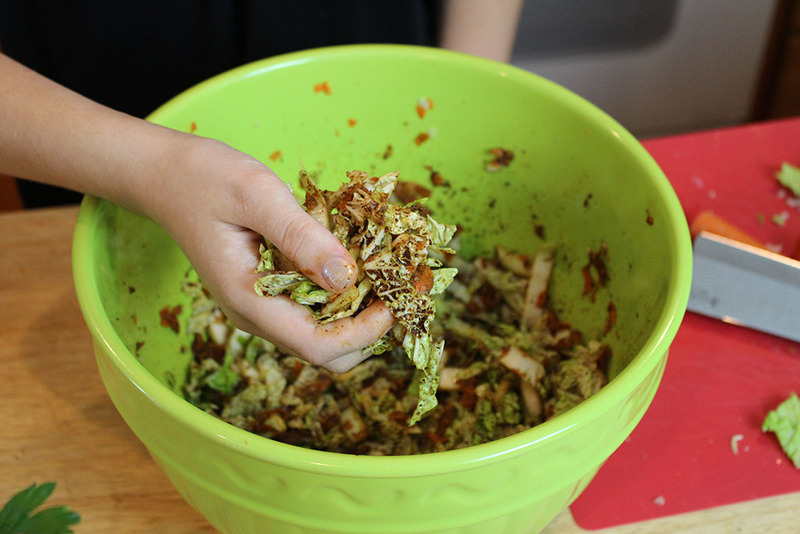 Also, I usually soak my veggies (including cabbage cut into halfs) in white vinegar before shredding, will this affect the fementation process? 2.Yes, you can use Himalayan Pink salt. 3.Soaking them in vinegar would effect the fermentation process and I don’t recommend it. Thank you for a terrific tutorial. I am starting into my second year of sauerkraut and will venture into other veggies also. (I have more crocks on the way.) Question: I’ve ordered too much starter culture packets. They say to refrigerate. Do you suppose they will last longer if I freeze them? Thank you. Refrigerated is best, as freezing can diminish the bacteria. Yes, you will receive more benefits from adding kefir whey and yes, your body will make K2 from the bacteria which is a win win! Always use a lid when making veggies. Here are a couple blogs to help. Just wanted to let you know, I sampled my fermented coleslaw style vege today made with kefir whey and topped off with olive oil. It was absolutely delicious, thanks. Do you use the same kind of kefir grains for water kefir and milk kefir? Also what type of water do you use for the veggies; distilled, tap, filtered or what? 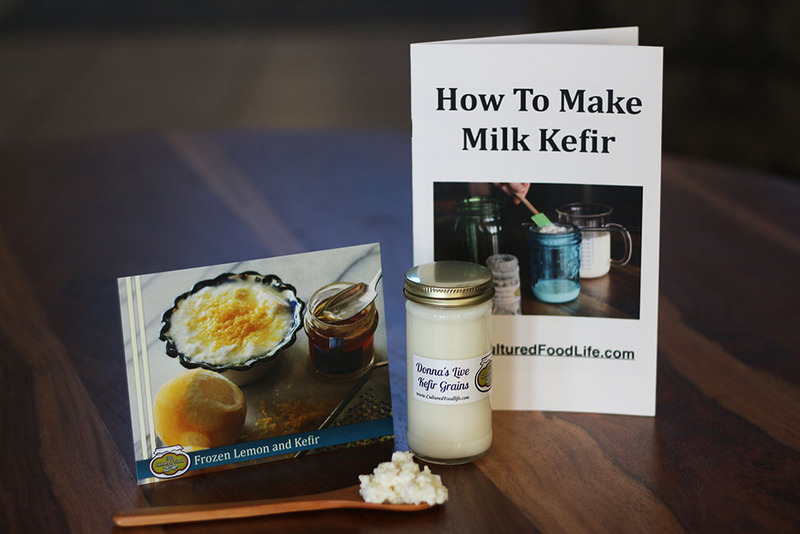 There are different kefir grains for milk and water kefir. 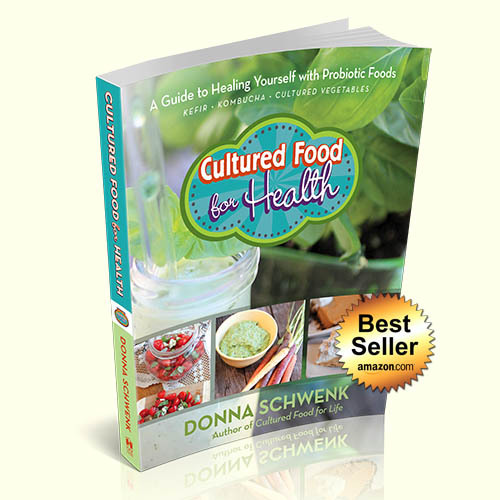 Cultured veggies do best with filter or spring water. Don’t use distilled because it lacks minerals which cultured veggies need.